← Three and a bit. Unsurprisingly, I have overreached somehwat, as is customary at this time of year. 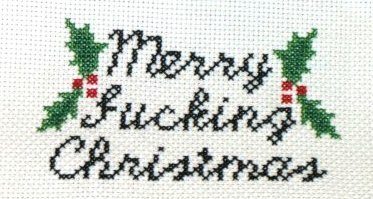 This means that I have a whole stack of stuff just waiting to be posted – exegetical profanity, wedding amigurumi and kris kringle cross-stitch, not to mention knitted angler fish, more dad-geekery and Exciting Craft Plans. However, actually posting these things at the moment is completely beyond me. I’ll get to them in the new year, promise. (Along with finally upgrading my damn blog theme to something at least a little customisable, because this one is frankly giving me the shits.) Anyway, right now, all that thinking and photographing and writing? It’s not gonna happen. I have too much stuff still to make. In the meantime, please enjoy my offering for the holiday season. I made it last year, but the sentiment still rings as true as ever.